100 Yard Rifle Range with 15 shooting bays. Only at the Shooting Bench. FIREARMS MUST FACE DOWN RANGE and be in a safe condition with actions open, magazines (and all ammunition) removed. 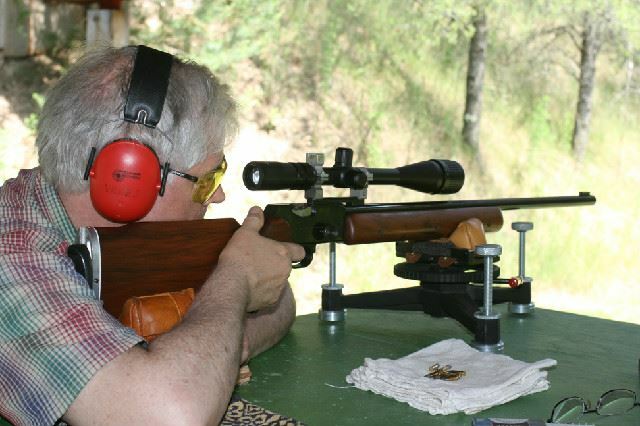 To move an uncased rifle from the bench to the rifle racks, it must be in a safe condition. All ammunition must be removed, the action open, and the firearm carried with the muzzle pointing straight up to the rack, and must be moved the same way when taken back to the shooting bench. Shotguns may be used with the restriction that only slugs are used. Target stands may only be at the back stop. Fixed target stands are provided by the club. The Property Manager will replace the target backing material when appropriate. Members must remove shot targets after use. No shooting positions are allowed forward of the bench shooting area.